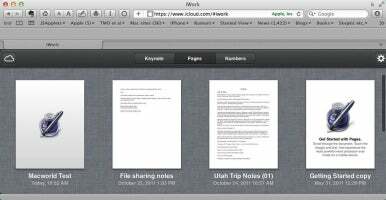 Via iCloud, iWork documents can auto-sync among iOS devices. But not Macs. You can manually copy a document from a Mac to iCloud—and vice versa—via iCloud’s web interface. But there is no automatic syncing. At least not with Apple’s officially supported methods. This means, for example, if you edit an iWork document on a Mac, the copy of the document already in iCloud is not updated to reflect the edits. I view this as a significant shortcoming. I had hoped that iCloud would work more like Dropbox. Nope. But here’s some good news: If you’re willing to stray from Apple’s recommended path, you can auto-sync between Macs and iCloud—without any need for a web browser. You do it via the Mobile Documents folder—an iCloud-based folder on your Mac that works a lot like Dropbox. You’ll find it in the Library folder of your Home directory. I mentioned this folder in my column last week. But I did not fully appreciate the potential value of the folder until after the column had been posted. With this follow-up article, I make up for the oversight. Using the Mobile Documents folder, you can bypass the iWork section of the iCloud website—directly syncing documents between your Mac(s) and iCloud. Not just copying documents, but syncing them. That is, any changes you make to an iWork document on a Mac will be automatically reflected in the iCloud copy. The Mobile Documents folder revealed. I just added the “Macworld Test” Pages document to the folder. 1. Holding down the Option key, access the Finder’s Go menu and select Library. This takes you to the (invisible in OS X Lion) Library folder in your Home directory. 2. Scroll down to locate the Mobile Documents folder. Create an alias of the folder and drag it to whatever location you want for easy access. I put it on my Desktop. Optionally, you might rename the folder alias—to something like iCloudSync. You are now ready to start syncing. 3. Double-click the folder alias to reveal its contents. What you will see depends upon what exactly you have previously set up to sync via iCloud. Assuming you previously enabled iCloud syncing for iWork apps, you should at least see three folders, one for each iWork app: com~apple~Keynote, com~apple~Numbers, and com~apple~Pages. Inside each folder will be two subfolders: Documents and iWorkPreviews. 4. Open the Documents folder inside the application folder that matches the document type you want to sync. For example, to sync a Pages document, go to com~apple~Pages -> Documents. 5. Via the Finder, drag the icon of the desired Pages document to this folder (drag a copy of the document, if you want to preserve the original as a backup). iCloud’s Pages page in Safari. The “Macworld Test” article that I placed in the Mobile Documents folder is here. The document will now automatically and almost instantly sync with iCloud. You can confirm this by going to the Pages webpage in the iWork section of iCloud: the document will be there. If you remove a file from the Mobile Documents folder, the file is removed from iCloud as well. Further, if you go to the Mobile Documents folder of any other Mac that you are syncing with iCloud, the same document will be listed there. 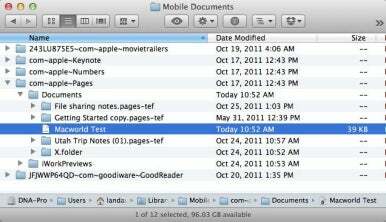 For example, if you placed a Pages file into Mobile Documents on your iMac, the document will also appear in the comparable folder on your MacBook. If you double-click the Mobile Documents-located Pages file on any of your Macs, it will open in Pages. From here, you can edit the document. Any changes that you make, on any of your Macs, will be viewable on all your Macs—via iCloud syncing! I would avoid editing the same document from two Macs simultaneously, so as to prevent a potential conflict. Beyond that, all should work perfectly. At least it has in my testing. So far, so good. But what if you want to open the transferred Pages document in the iOS version of Pages? You can do so. The document will then appear in Pages’ documents list, just as if you had transferred the document via the iCloud Web interface. If you open the document in Pages for iOS, however, the file is converted to an iOS-compatible format, stripping out any Mac-only features. This will incidentally place a preview image of the document in the relevant iWorkPreviews folder back in Mobile Documents. The converted Pages document will auto-sync among your iOS devices, where it can be opened and edited by Pages for iOS on any synced device. However, you will no longer be able to open the document on a Mac (see last week’s column for more details on this point). Again, this is the same way that things would work if you had used the iCloud web interface to transfer the document. To convert an iOS-formatted iWork document to a Mac-compatible format and transfer it from iCloud to your Mac, you must download the file from the iCloud website via a web browser. This is the one occasion where the Mobile Documents folder is not a substitute for the iCloud website. There is as yet no unified iWork document format that will allow you to auto-sync and edit the same document on both Macs and iOS devices. It is either one or the other. Aside from this limitation, the Mobile Documents folder allows true syncing of iWork documents, bypassing any need for the iCloud web interface. Given how well this all works, I am a bit surprised that Apple has chosen to hide the Mobile Documents folder from end users. I’m guessing it has to do with potential confusion between Mac and iOS versions of iWork documents. Or maybe Apple just wasn’t ready to have users mucking around in this folder, possibly getting themselves in trouble. Hopefully, down the road, perhaps after Apple updates the Mac versions of its iWork apps, we’ll see a change in this regard. Until then, you can use the work-around described here.